Bruce and Denise Morcombe can only wonder what their son Daniel could have achieved in that time if the horrible events of December 7, 2003, did not unfold. "You do wonder; with Brad getting married next year and having bought a new house and Dean owning a house," Mrs Morcombe said of Daniel's brothers. Father Bruce said seeing Daniel's twin Brad growing up since, they could not help but envisage their slain son going through the same "everyday things" if he were still alive. Buying his first car. Getting his first full-time job. Girlfriends and marriage. Buying a house. "All of those things Brad has achieved in that 10-year period," Mr Morcombe said. 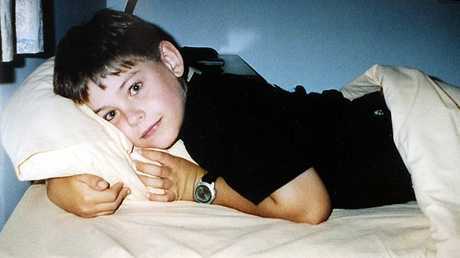 "It's obviously with great sadness that you think Daniel has been deprived of that 10 years and the next 50 years." Mr and Mrs Morcombe - who farewelled their son in an unforgettable, heartbreaking public funeral one year ago today - are this year holidaying in Tasmania for the anniversary. "It was intentional to have some separation from Palmwoods and the events that took place 10 years ago," Mr Morcombe said. "We're just trying to move on best we can. But always in the back of our mind is the looming (murder) trial on February 10." Mrs Morcombe said December was an awful month for her family - with Daniel's disappearance, birthday and Christmas all within 19 pain-filled days. But she said she was proud of everything they had been able to achieve in the 10 years since the tragedy. "We've tried our hardest to get up every day and do something positive," she said. "It would have been a lot easier to sit in a chair and do nothing - but we didn't do that. "We've been able to help a lot of kids." Police officers, SES searchers, media and Daniel's school mates will all be thinking of where they were when the boy in the red shirt disappeared. Brett Peter Cowan is set to face trial next year charged with Daniel's murder. November 26, 2012: Committal hearing begins. Brett Peter Cowan charged with murder, child stealing, deprivation of liberty, indecent treatment of a child and interfering with a corpse. December 7, 2012: Daniel Morcombe is laid to rest in emotional service at Catherine of Siena Church at Sippy Downs, nine years to day after he vanished.